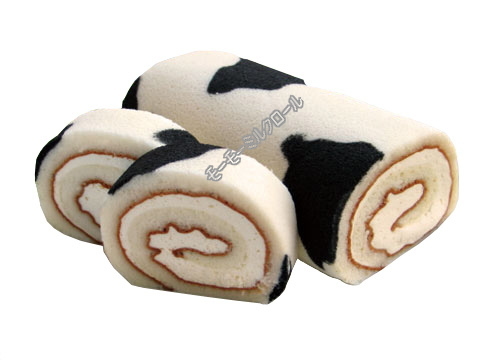 Japanese pâtissier took roll cakes to a new height by coming up with artistic decorations.This one makes headlines with its cute cow patterns when it was featured on TV and magazines. They even have a funny name for it, of course totally “cow”. The name is “Moo moo milk roll”. If you are curious about what is the ingredient used to create the black patches, it said edible bamboo charcoal. Cake roll for afternoon tea,,, sinful but sounds good! And it wouldn’t harm to have something that looks so lovely. but too bad, it is only sold in Japan .:*~*:. 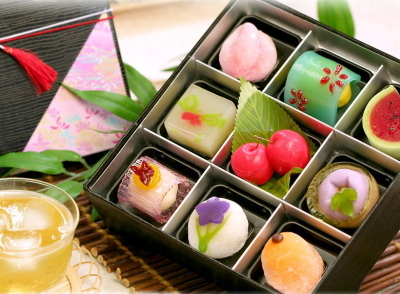 It is “love in first sight” with these limited edition Japanese sweets (wagashi). Could you tell that they were sea breams (Tai) ? I thought that they look ugly. But again that was precisely what caught my heart! And looking so real and big are those eyes that were not missed. Contrary to the eyes, there was a tinge of melancholy & loneliness, on the way that the mouth was created. Simply love the delicate scales and fins details that were crafted all over their round body. How? 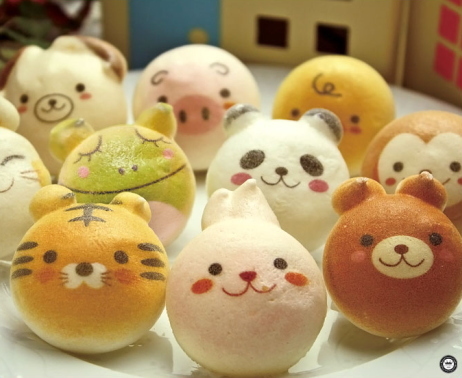 Aren’t you in love with these Japanese Tai sweets? 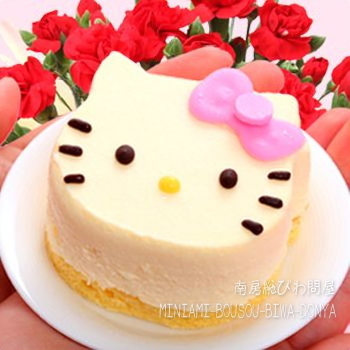 It couldn’t be wrong to opt for Hello Kitty cheesecake if you wanted something that is “straightforwardly” cute. Cheesecake is a “NO” because you are on diet? No problem! Hey, Kitty cheesecake is about the size of the palm only. The taste of Japanese are simply fantastic! 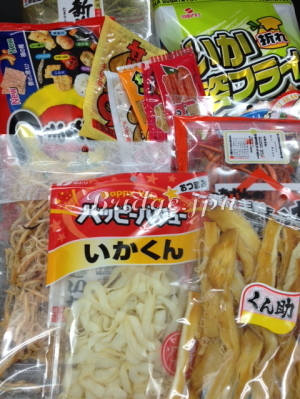 At request of a friend who simply loves Japanese cuttlefish and crackers, I made two separate trips to the nearby candy store, grasping everything that had the word “cuttlefish” written on it. The candy shop was flooded with people looking to make their last purchases for the upcoming New Year. Japanese loves munching snacks with sake (alcoholic drinks), while watching special New Year programs like Kōhaku Uta Gassen. 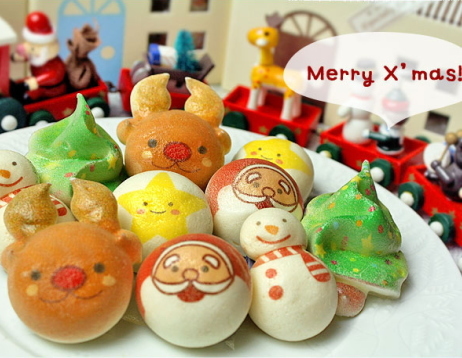 And if you have some Japanese sweets in mind you want to buy, please do not hesitate to contact us for inquiries. 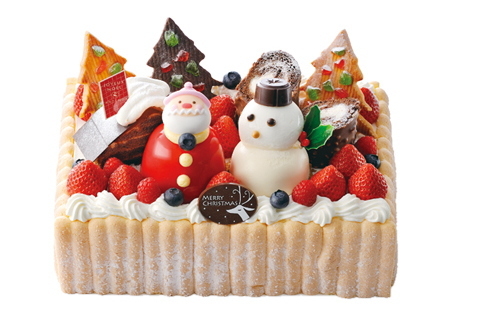 Ever wonder how Christmas cakes look like in the creative hands of the Japanese? 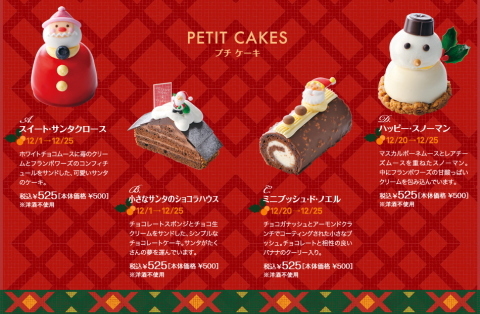 Since Christmas Day is round the corner, here are some collections picked up from Antenor, a famous cake and pastry shop in Japan. Do check out on their site if you are interested. Christmas Yule log cake has been a standard in the world. 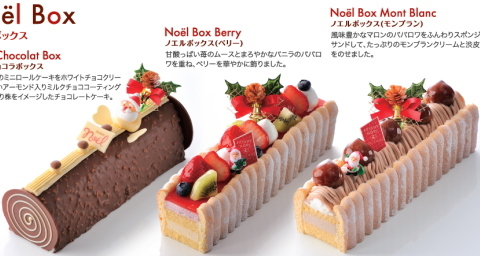 Antenor’s log cakes came with a total of 3 flavors, Chocolat, Berries and Mont Blanc. 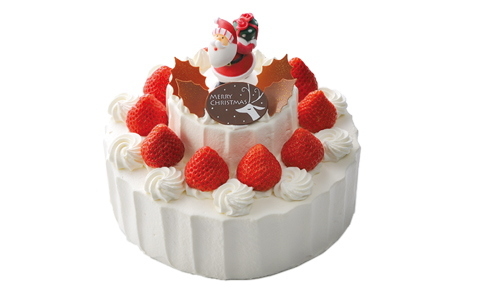 And how sweet to incorporate Santas Claus into the design. Can you tell this cake is large enough to share 20 people? A 2 tier cake! ?No, its not a wedding cake. And of course, it’s a Christmas cake. And there he is, the leading star, Santa standing right at the top looking for the next destination to dispatch his gifts! Cute little thing, isn’t he? Calories is your big enemy? Opt for the single pieces Christmas cake. In a real world, tigers, rabbits, pandas, pigs, monkeys, won’t be getting along in harmony. It is a practical world with carnivores, herbivores & omnivores. Wow amazing! Aren’t they cute little things? Not only with kids, these macarons are an extreme hit with adults too. Although these macarons are far from the images of those Japanese traditional sweets, but its another creative idea that was born because of Japanese’s love for artistic & beautiful things. Do check out on the shopping site if you are interested. And of course, they came up with the Christmas limited edition! 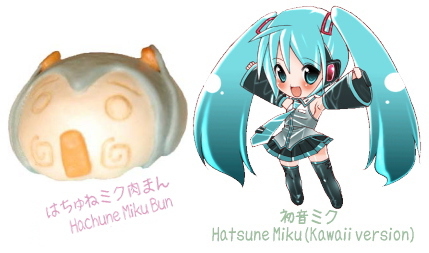 “FamilyMart”, a convenience store in Japan, collaborated to produce “Hachune Miku meat bun”. It had started appearing on the steamer of FamilyMart since 14th-Aug.
For a limited period only, FamilyMart targets to sell 80 thousand buns at 180yen each. “Hachune Miku meat bun” could “unaccountably” be the most delicious meat bun that Hatsune Miku lovers will ever have (^_-)v .
It collaborated with Sanrio to produce “Hello Kitty meat bun”, which will start selling from this coming 16th October. “Circle K Sunkus” seems determined to win this one because “Hello Kitty meat bun” each at 150yen is 30yen cheaper than “Hachune Miku meat bun” (- – ;;)!! And what’s more,,, it targets to sell 150 thousand meat buns for a one month limited period. Trust me. 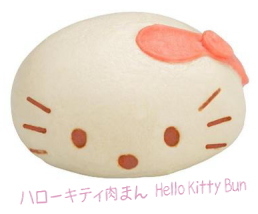 “Hello kitty meat bun” is going to be snatched up like crazy. In my opinion, one of the must try if you are in Japan is “Mister Donut”. Why donut? What’s so special? Take a look at the donut menu. Doesn’t it convince you that you should give them a try? Hey, they really are as delicious as they looked. Japan’s Mister Donut group has went through a lot of trouble to ensure their donuts stay competitive in Japan. Not only do the donuts come in all sorts of interesting shapes, the varieties are great and texture is something that you can really enjoy because each type is unique in their own way .And without saying,,, affordable price is what attracts too. 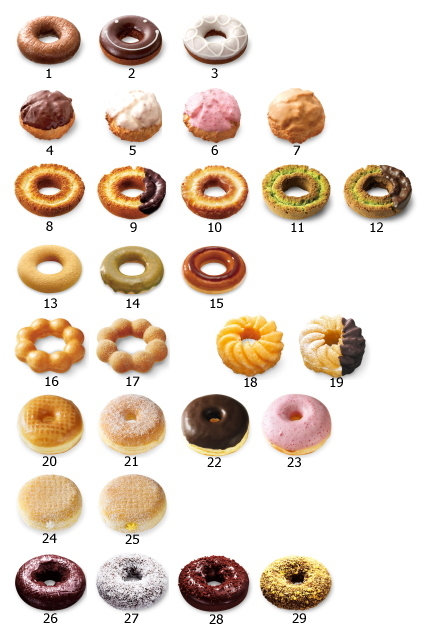 My favorite will be the regular, very popular “Pon de Ring”. Sapporo ichiban had the latest two pokemon movies (shown in summer), packaged into limited edition pokemon cup noodles. The concept of pokemon cup noodles isn’t new and there are two flavors, soya sauce (left) or seafood (right). The lovely packaging is one reason it attracts. But here is another reason why I think kids can’t get enough of pokemon cup noodles. 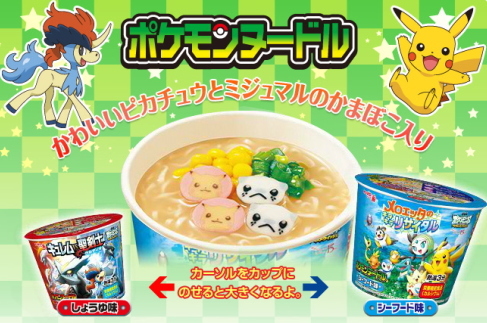 Imagine ingredients, shaped into Pikachu & Pokabu or tepig (soya sauce flavor) OR Pikachu & Oshawott (seafood flavor) floating on top the soup, staring back at you. Before you even know it, your kids will be gobbling down all pokemons and asking you for more!! It is Japanese nature to pursue beauty and perfection and food is just one of them. Often, it is said that Japanese food is not only about taste but also a masterpiece for admiration. Do you know about traditional Japanese sweets “wagashi”? “Wagashi” always looks very appetizing with its well considered color balancing, exquisite design and the use of vivid colors. The overall presentation is just like a piece of art. Each is handmade and packed into classy looking boxes. I am sure no one would mind to pay a little bit more for such exquisite work. But I got mixed feelings about eating something that looks this good (^-^;). 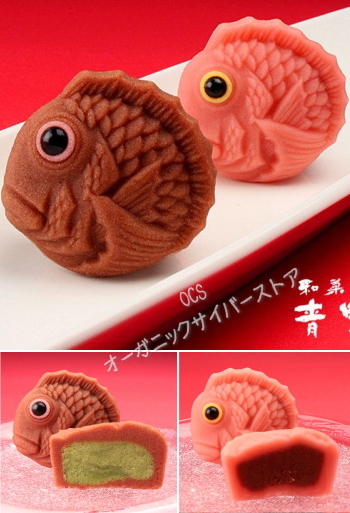 Check out on the wagashi shopping site if you are interested. UNIQLO is well-known for clothing with good clothing at affordable prices. Perhaps the most famous representative revolutionary products were “heatec” and “coolbiz”. 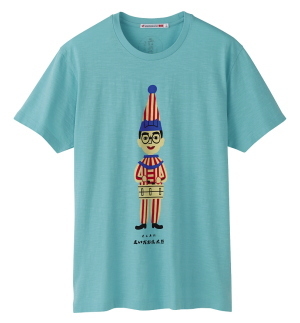 Though UNIQLO is expanding worldwide, still, some items are only limited for sale in Japan. I picked up some interesting T-shirts. These are the collaboration works between UNIQLO and famous Japanese food companies having very long history. UNIQLO & Okame Natto. In short, Natto, fermented soybean, is a traditional food for breakfast. You either love or hate them because of the smell. 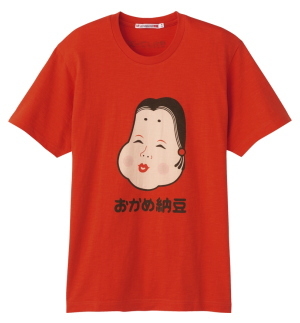 The character Okame, with her nostalgic face has been the representative logo of Okame Natto . Doesn’t she look cute? Kuidaore Taro, is a famous mascot character from Osaka. Being the star of a restaurant, he became well-known only after retirement. He makes occasional appearance on TV. Sounds crazy, but the last time he went travelling, it even made news on TV! Even “Yotsuba”, a Hokkaido butter company, joined forces with UNIQLO! The butter in the picture “with salt” version. Why don’t they make the one with “No salt” version?? “Tengumai” is Japan’s sake manufacturing company. Good choice with the logo. It looks cool and very traditional. Too bad, I don’t drink, so I won’t have a chance to know how they taste. Ok, that’s about all. 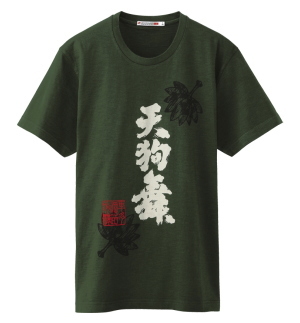 Do inquire with us if you want any UNIQLO items that are only limited for sale in Japan. We buy and send them overseas. Bridge.jpn is a shopping agent in Japan. We offer Japan shopping services both online and in-store purchases for people residing overseas looking to buy Japanese products. We also provide services to buy Ghibli museum tickets & fujiko f fujio museum tickets. For detail about our services. Copyright © 2011-2014 Bridge.jpn. All Rights Reserved.